Washington Navy Yard, Site Of Shooting, Has Long History : The Two-Way Located on the banks of the Anacostia River and near the Washington Nationals ballpark in southeast D.C., it is the U.S. Navy's oldest shore facility. Today, it employs thousands of people and is home to the command that oversees ship construction, as well as the Judge Advocate General's Corps. 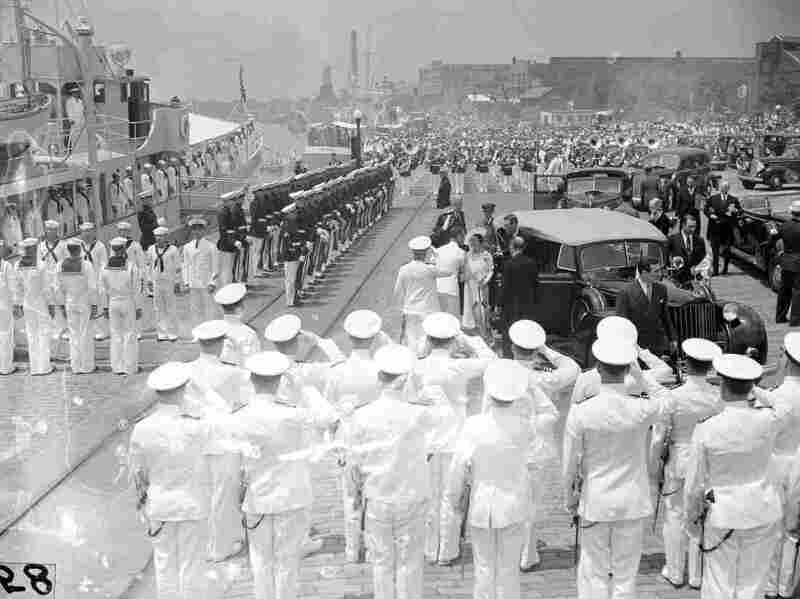 King George VI and Queen Elizabeth arrive at the Washington Navy Yard on June 9, 1939, to join President Franklin Roosevelt on a cruise down the Potomac River to Mount Vernon, Va. 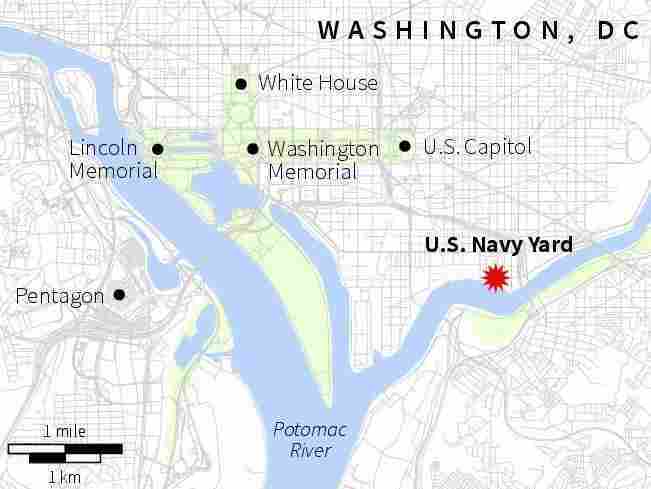 The sprawling Washington Navy Yard, scene of a deadly shooting Monday, is the Navy's oldest shore establishment and has long been considered the "ceremonial gateway" to the nation's capital. The yard went into operation at the turn of the 19th century. Today, it employs thousands of people and is regarded as the "quarterdeck of the Navy" for its role as headquarters for the Naval District Washington. Located on the banks of the Anacostia River and near the Washington Nationals ballpark in southeast D.C., it is home to several key commands, including the Naval Sea Systems Command (NAVSEA), which oversees ship and submarine construction and maintenance, and the Judge Advocate General's Corps, which is the Navy's legal arm. The location of the U.S. Navy Yard in Washington, D.C., where a shooting took place on Monday. The Naval Sea Systems Command's headquarters building, Building 197, was the site of Monday's attack. About 3,000 people, both military personnel and civilians, work there. According to the Navy, NAVSEA "is the largest of the Navy's five system commands. With a fiscal year budget of nearly $30 billion, NAVSEA accounts for one quarter of the Navy's entire budget." "The Naval Sea Systems Command is comprised of command staff, headquarters directorates, affiliated Program Executive Offices (PEOs) and numerous field activities." The Navy (and Marine Corps) Judge Advocate General Corp's lawyers serve as primary legal advisers to the various Naval commands and as prosecutors during military courts-martial. The Washington Navy Yard is the venue for many such proceedings. "The Washington Navy Yard was also the scene of many scientific developments. Robert Fulton conducted research and testing on his clockwork torpedo during the War of 1812. In 1822, Commodore John Rodgers built the country's first marine railway for the overhaul of large vessels. John A. Dahlgren developed his distinctive bottle-shaped cannon that became the mainstay of naval ordnance before the Civil War. In 1898, David W. Taylor developed a ship model testing basin which was used by the Navy and private shipbuilders to test the effect of water on new hull designs. The first shipboard catapult was tested in the Anacostia River in 1912, and a wind tunnel was completed at the yard in 1916. The giant gears for the Panama Canal locks were cast at the yard. Navy yard technicians applied their efforts to medical designs for prosthetic hands and molds for artificial eyes and teeth." "The Yard played a small but significant role in the events following the assassination of President Lincoln on April 15, 1865. Following the capture of eight of the conspirators, they were brought to the Yard and held on vessels anchored on the Anacostia River prior to their trails. The body of John Wilkes Booth was examined and identified on the monitor Saugus, moored at the Yard. "Today the Navy Yard houses a variety of activities. It serves as headquarters, Naval District Washington, and houses numerous support activities for the fleet and aviation communities. The Navy Museum welcomes visitors to displays of naval art and artifacts which trace the Navy's history from the Revolutionary War to the present day. The Naval Historical Center is housed in a complex of buildings known as the Dudley Knox Center for Naval History. Leutze Park is the scene of colorful ceremonies. And inside the buildings, the Washington Navy Yard continues to serve the Navy and the nation."